Astronomers have built telescopes which can show myriads of stars unseen before; but when a man looks through a tear in his own eye, that is a lens which opens reaches into the unknown, and reveals orbs which no telescope, however skilfully constructed, could do. Better far off to leave half the ruins and nine-tenths of the churches unseen and to see well the rest; to see them not once, but again and often again; to watch them, to learn them, to live with them, to love them, till they have become a part of life and life’s recollections. Come, see the north-wind’s masonry, Out of an unseen quarry evermore Furnished with tile, the fierce artificer Curves his white bastions with projected roof Round every windward stake, or tree, or door. Speeding, the myriad-handed, his wild work So fanciful, so savage, naught cares he For number or proportion. If our so-called facts are changing shadows, they are shadows cast by the light of constant truth. So too in religion we are repelled by that confident theological doctrine… but we need not turn aside from the measure of light that comes into our experience showing us a Way through the unseen world. Swarthmore Lecture (1929) at Friends’ House, London, printed in Science and the Unseen World (1929), 91. Imagination is the Discovering Faculty, pre-eminently. … It is that which feels & discovers what is, the REAL which we see not, which exists not for our senses. … Mathematical science shows what is. It is the language of unseen relations between things. … Imagination too shows what is. … Hence she is or should be especially cultivated by the truly Scientific, those who wish to enter into the worlds around us! Lovelace Papers, Bodleian Library, Oxford University, 175, folio 199, journal entry for 5 Jan 1841. As quoted and cited in Dorothy Stein (ed. ), 'In Time I Will Do All, I Dare Say', Ada: A Life and a Legacy (1985), 128. 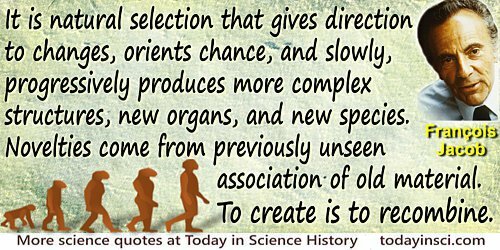 It is natural selection that gives direction to changes, orients chance, and slowly, progressively produces more complex structures, new organs, and new species. Novelties come from previously unseen association of old material. To create is to recombine. In 'Evolution and Tinkering', Science (10 Jun 1977), 196, 1163. A parody of Shelley as 'A Paradoxical Ode', quoted in Lewis Campbell and William Garnett, The Life of James Clerk Maxwell (1882), 649-650. And breathing realms of fin, and feet, and wing. An embryon point, or microscopic ens! The Temple of Nature (1803), canto 1, lines 295-314, pages 26-8. Suppose that we are wise enough to learn and know—and yet not wise enough to control our learning and knowledge, so that we use it to destroy ourselves? Even if that is so, knowledge remains better than ignorance. It is better to know—even if the knowledge endures only for the moment that comes before destruction—than to gain eternal life at the price of a dull and swinish lack of comprehension of a universe that swirls unseen before us in all its wonder. That was the choice of Achilles, and it is mine, too. Widely seen on the Web, but always without citation, so regard attribution as uncertain. Webmaster has not yet found reliable verification. Contact Webmaster if you know a primary print source. Suppose then I want to give myself a little training in the art of reasoning; suppose I want to get out of the region of conjecture and probability, free myself from the difficult task of weighing evidence, and putting instances together to arrive at general propositions, and simply desire to know how to deal with my general propositions when I get them, and how to deduce right inferences from them; it is clear that I shall obtain this sort of discipline best in those departments of thought in which the first principles are unquestionably true. For in all our thinking, if we come to erroneous conclusions, we come to them either by accepting false premises to start with—in which case our reasoning, however good, will not save us from error; or by reasoning badly, in which case the data we start from may be perfectly sound, and yet our conclusions may be false. But in the mathematical or pure sciences,—geometry, arithmetic, algebra, trigonometry, the calculus of variations or of curves,— we know at least that there is not, and cannot be, error in our first principles, and we may therefore fasten our whole attention upon the processes. As mere exercises in logic, therefore, these sciences, based as they all are on primary truths relating to space and number, have always been supposed to furnish the most exact discipline. When Plato wrote over the portal of his school. “Let no one ignorant of geometry enter here,” he did not mean that questions relating to lines and surfaces would be discussed by his disciples. On the contrary, the topics to which he directed their attention were some of the deepest problems,— social, political, moral,—on which the mind could exercise itself. Plato and his followers tried to think out together conclusions respecting the being, the duty, and the destiny of man, and the relation in which he stood to the gods and to the unseen world. What had geometry to do with these things? Simply this: That a man whose mind has not undergone a rigorous training in systematic thinking, and in the art of drawing legitimate inferences from premises, was unfitted to enter on the discussion of these high topics; and that the sort of logical discipline which he needed was most likely to be obtained from geometry—the only mathematical science which in Plato’s time had been formulated and reduced to a system. And we in this country [England] have long acted on the same principle. Our future lawyers, clergy, and statesmen are expected at the University to learn a good deal about curves, and angles, and numbers and proportions; not because these subjects have the smallest relation to the needs of their lives, but because in the very act of learning them they are likely to acquire that habit of steadfast and accurate thinking, which is indispensable to success in all the pursuits of life. In Lectures on Teaching (1906), 891-92. The scientific answer is relevant so far as concerns the sense-impressions… For the rest the human spirit must turn to the unseen world to which it itself belongs. Swarthmore Lecture (1929) at Friends’ House, London, printed in Science and the Unseen World (1929), 43. There are many things akin to highest deity that are still obscure. Some may be too subtle for our powers of comprehension, others imperceptible to us because such exalted majesty conceals itself in the holiest part of its sanctuary, forbidding access to any power save that of the spirit. How many heavenly bodies revolve unseen by human eye! From Quaestiones Naturales as translated in Charles Singer, From Magic to Science (1958), 57. In 'A Collection of Apophthegms, New and Old' (1625). As given in Essays, Moral, Economical, and Political: A New Edition, With the Latin Quotations Translated (1813), No. 149, 308. Through fear of being shown to be vacuous, religion denies the awesome power of human comprehension. It seeks to thwart, by encouraging awe in things unseen, the disclosure of the emptiness of faith. Essay collected in John Cornwell (ed. ), 'The Limitless Power of Science', Nature's Imagination: The Frontiers of Scientific Vision (1995), 125. We are many small puppets moved by fate and fortune through strings unseen by us; therefore, if it is so as I think, one has to prepare oneself with a good heart and indifference to accept things coming towards us, because they cannot be avoided, and to oppose them requires a violence that tears our souls too deeply, and it seems that both fortune and men are always busy in affairs for our dislike because the former is blind and the latter only think of their interest. 'Letter to Bellini' (17 Oct 1689), in H. B. Adelmann (ed. ), The Correspondence of Marcello Malpighi (1975), Vol. 4, 1534. We see it [the as-yet unseen, probable new planet, Neptune] as Columbus saw America from the coast of Spain. Its movements have been felt, trembling along the far-reaching line of our analysis with a certainty hardly inferior to that of ocular demonstration. Address to the British Association, Southampton (10 Sep 1845). Quoted in Memoirs of the Royal Astronomical Society (1847), 16, 400. We should admit in theory what is already very largely a case in practice, that the main currency of scientific information is the secondary sources in the forms of abstracts, reports, tables, &c., and that the primary sources are only for detailed reference by very few people. It is possible that the fate of most scientific papers will be not to be read by anyone who uses them, but with luck they will furnish an item, a number, some facts or data to such reports which may, but usually will not, lead to the original paper being consulted. This is very sad but it is the inevitable consequence of the growth of science. The number of papers that can be consulted is absolutely limited, no more time can be spent in looking up papers, by and large, than in the past. As the number of papers increase the chance of any one paper being looked at is correspondingly diminished. This of course is only an average, some papers may be looked at by thousands of people and may become a regular and fixed part of science but most will perish unseen. 'The Supply of Information to the Scientist: Some Problems of the Present Day', The Journal of Documentation, 1957, 13, 195. Weeds function as an unseen tax on the crop harvest. From 'War on Weeds', Science (19 Apr 1946), 103, No. 2677, 465. What a glorious title, Nature, a veritable stroke of genius to have hit upon. It is more than a cosmos, more than a universe. It includes the seen as well as the unseen, the possible as well as the actual, Nature and Nature's God, mind and matter. I am lost in admiration of the effulgent blaze of ideas it calls forth. From 'History' web page of NPG, Nature Publishing Group, www.nature.com. You may tear apart the baby’s rattle and see what makes the noise inside, but there is a veil covering the unseen world which not the strongest man, nor even the united strength of all the strongest men that ever lived, could tear apart. 'Is There a Santa Claus,' editorial in the New York City newspaper, The Sun (21 Sep 1897), 6.